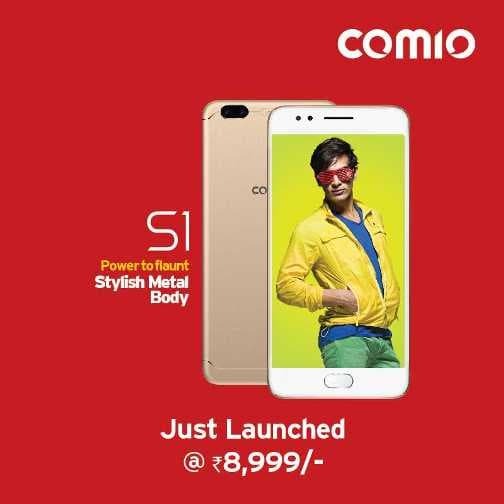 Comio, a new smartphone brand has arrived in India. Comio is a Chinese smartphone manufacturer which is backed by Topwise Communications which is an original device maker which makes printed circuit boards for Indian brands like Micromax. Comio has appointed Sanjay Kalirona as the chief executive officer and director for the Indian market. They have also roped in Bollywood actress Yami Gautam to promote their three new smartphones the Comio S1, Comio P1 and Comio C1. These three smartphones cost less than ten thousand rupees and will be available in retail stores first and later online. Comio smartphones will arrive in over 15000 retail outlets and 400 after sale service stations will be opened soon. The first smartphone in the Comio series is the Comio P1. This is the most expensive of the lot as it is priced at Rs. 9,999. 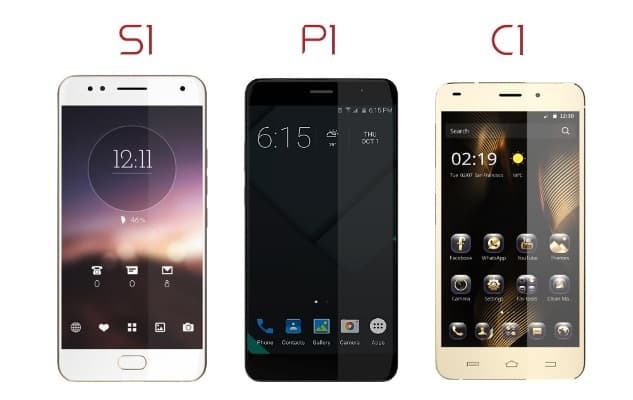 The Comio P1 will be available in Metal Grey and Sunrise Gold colour variants. The Comio P1 has a 5.5inch HD resolution display. Underneath the hood we have an unspecified chipset that houses a 64-bit 1.3GHz quad core processor and 3GB of RAM to run Android Nougat operating system. The Comio P1 has an internal memory of 32GB and allows memory expansion with the help of microSD cards. 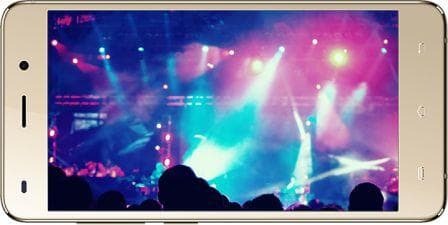 The Comio P1 has a 13MP camera on the rear with flash and an 8MP camera on the front with screen flash. 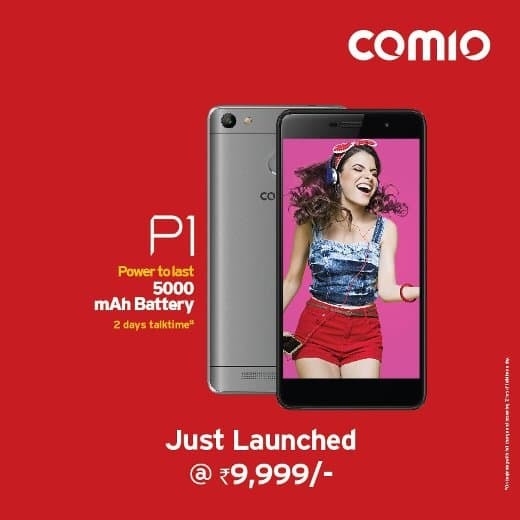 The biggest highlight of the Comio P1 is the 5000mAh battery which can last for two days on average use. The next smartphone in the Comio series is the Comio S1. The Comio S1 costs Rs. 8,999 and will be available in Royal Black and Sunrise Gold colour variants. The Comio S1 has a 5.2 inch HD resolution display. The Comio S1 has a 1.3GHz 64 bit quad core processor along with 2GB of RAM to run Android Nougat operating system. The Comio S1 has an internal memory of 32GB. The Comio S1 has a 13MP camera on the rear and an 8MP camera with flash on the front. The Comio S1 has a fingerprint sensor and 2700mAh battery. The final smartphone in the Comio series is the Comio C1. The Comio C1 costs Rs. 5,999 and will be available in Mellow Gold and Space Black colour variants. The Comio C1 has a 5inch HD IPS panel display. Underneath the hood we find the same 64bit 1.3GHz quad-core processor along with 1GB of RAM to run Android Nougat. The Comio C1 has an internal memory of 32GB. The Comio C1 has a 8MP camera on the rear and a 5MP camera on the front. The Comio C1 is powered by a 2200mAh battery. All Comio smartphones come with 1 year warranty and an additional 100 days of warranty for free. Comio is also offering 30 days free replacement. If you want to exchange a Comio smartphone within a year you will get up to 40% of the original value of the phone on your new one. Just like Xiaomi, Comio loads its homemade antivirus and cleaner apps on all smartphones.